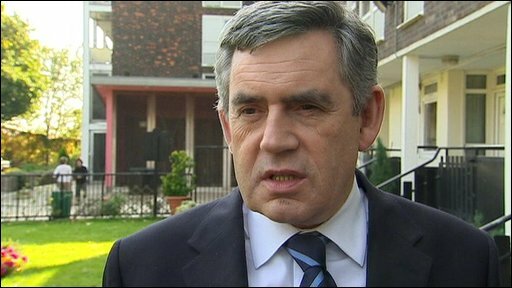 Gordon Brown: "People must abide by the decisions that are made"
Gordon Brown has urged MPs to "deal with" a retrospective expenses audit, amid anger from some MPs who say the rules are unfair and inconsistent. Hundreds of MPs have had their expenses claims for the last five years reassessed by Sir Thomas Legg. Many backbenchers are livid, saying they must now repay claims that were fully approved by Commons officials. Sir Thomas was asked to look at every expenses claim after they were leaked to the Daily Telegraph in May. On the advice of Sir Thomas, Downing Street said on Monday that the Prime Minister would pay back £12,415 that he claimed largely for cleaning and gardening, even though the claims had been within the rules at the time. At a party meeting last night, Mr Brown urged Labour backbenchers to follow his example. But many MPs are said to be much more reluctant than Mr Brown to pay back expenses that were also claimed within the rules. The BBC's Westminster correspondent Jo Coburn said there was real anger among some MPs who think Sir Thomas has rewritten the remit of his inquiry to judge expenses by his own standards. Sir Thomas, a former civil servant, has applied new limits to categories like gardening and cleaning but some MPs are angry that claims for mortgage repayments have not been included. After the heavy criticism of MPs over expenses, few are prepared to criticise the new system publicly. One unnamed MP told The Independent: "The change in rules is just bizarre. There is no way it would stand up in a court of law." Mr Brown is not the only party leader to fall foul of Sir Thomas's new standards. The Conservatives' David Cameron has been asked by Sir Thomas to provide more information about payments for which he over-claimed in 2006 when he changed his mortgage. He had already repaid £218. Liberal Democrat leader Nick Clegg is to repay £910 of the £3,900 he claimed for gardening between 2006 and 2009. The SNP's Alex Salmond is repaying £710 for removal costs, which he claimed when he gave up his rented flat in London in 2007. He has also been asked to supply more information on £2,610 claimed for hotel stays.